Whenever you click on a link on a web page to open another one in the same browser, referrer information are sent to the linked site. 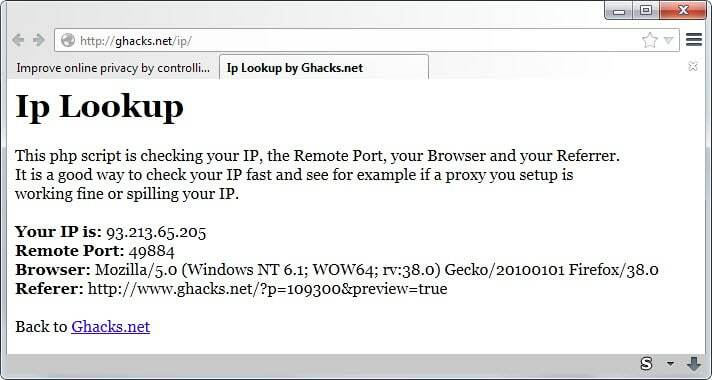 You can verify this for yourself by visiting our IP lookup script which reveals your current IP address and other information including the referer (it is a misspelling that is used in this way in the HTTP specification). The referrer field was designed to provide the linked web property with information about where a user originated from. Sites use referrer information for a variety of purposes. Analytics comes to mind but there are other purposes such as hotlinking protection or verification (if you don't have the right referrer, you are not allowed access). Some services add sensitive information to the referrer field. It became known recently that the Healthcare.gov includes personal data in the referrer. According to the news article, the site's referrer may include information about a person's age, income, zip code, smoking habit or pregnancy. Mozilla announced yesterday that it added support for the so-called meta referrer tag to Firefox Beta which provides developers with options to control referrer information on their sites. Reliance on developers to get it right (who did not in first place) is probably not the best option from a user perspective. Internet users can control referrer information on their end, and this guide looks at how that is done in popular browsers such as Mozilla Firefox or Google Chrome. Attention: Modifying the referrer may render some sites unusable. Some extensions below support whitelisting which you can use in this case to override the default behavior. Firefox users have the widest range of options when it comes to controlling referer information in the browser. HeaderControlRevived provides you with options to control the referer, user-agent and accept-language on a per-site basis. Referer Control offers full control over referrer information in Firefox. It ships with basic rules that you can switch between (the default is to strip the referrer when third-party requests are made), and options to override the default behavior for select sites. Smart Referer is a Firefox add-on that only sends referer information on the same domain. It supports whitelists and different modes that give you more control over the process but it should work right out of the box for most users. Besides through extensions, Firefox users can configure referrer information right on the browser's about:config page as well. 0 - never send the referring URL. 1 - send only when links are clicked. 2 - send for links and images (default). 0 - always send referrer (default). 1 - only send if base domains match. 2 - only send if hosts match. false - send the referrer (default). true - spoof the referrer and use the target URI instead. 0 - send full URI (default). 1 - scheme, host, port and path. 2 - scheme, host and port. Google Chrome users can install browser extensions (which may also work in Opera and other Chromium-based browsers) to control referrer behavior. Referer Control for Google Chrome strips referrer information when third-party requests are made by default. It features customization options for individual sites and options to set a custom global referer or block referers outright. Request Header Hook allows you to set cookie, referer and user-agent policies for individual sites. You have several options to control referrer information without installing extensions or manipulating browser settings. One of the easier options for links is to copy a link and paste it in a private browsing window or another browser to make a direct request. Services like NullRefer can be used to replace the referrer so that it is not sent when you load sites on the Internet. Now You: How do you handle referer information on your end? Internet users can control referrer information on their end, and this guide looks at how that is done in popular browsers such as Firefox or Chrome. Good article. I’ll be trying the built-in Fx settings first and will see how that goes. HeaderControlRevived is one of only two extensions I now know of that lets you control the Useragent on a per-site basis. Very useful. Sending no referer broke some things already, so I’ve adjusted my preferences to just Spoof (true) and Trim (2). Working well so far. Nope, even with just those two sites like Tesco Direct don’t work. Seems to be not such a good idea. Who cares if they know I got there via Google, really? @David — If your Firefox’s network.http.sendRefererHeader = 2 (default) or 1, Google Search will pass on both the referrer header AND your search terms to the destination sites. Also, if you clicked on a Tesco Direct link at iloveduck.com, Tesco Direct will know exactly from which page of iloveduck.com you came from. The ‘Referrer Control’ add-on allows you to whitelist sites, so that they don’t break. The tradeoff is that you have to let these sites have the referrer info. Note: For the ‘Referrer Control’ add-on to work properly, retain Firefox’s network.http.sendRefererHeader = 2 (default), & set the add-on’s Rule Preferences as “remove” (ie. remove referrer info for non-whitelisted sites). If you set network.http.sendRefererHeader = 0, the sites you whitelist in the add-on will continue to break. Therefor : network.http.referer.XOriginPolicy is the first setting to consider. @Tom — I think “meh” (‘Smart Referer’ add-on developer) & “JeremiasFromHere” (commenter at Mozilla add-ons) are not the same person ? To me, it seems what “JeremiasFromHere” was trying to say is that these 3 “newly-introduced” Firefox prefs (network.http.referer.XOriginPolicy / spoofSource/ trimmingPolicy) have made the ‘Smart Referer’ add-on redundant when the user goes from a.example.com to b.example.com (ie. same base domain but different hosts). According to github.com/meh/smart-referer, this add-on (purpose: send referers only when **staying on the same domain**) creates the following new (otherwise non-existent) prefs in about:config. By default (unless whitelisted), the SR add-on prevents referrers from being sent when one goes from a.example.com to b.example.com, even when network.http.referer.XOriginPolicy = 0 [default, always send]. I don’t think the SR add-on disturbs Firefox’s default settings for network.http.referer.spoofSource or network.http.referer.trimmingPolicy. If these are changed to non-default values, my guess is that they are ignored if the SR add-on is enabled. On Firefox, I use Smart Referer. For Chromium, I use KISS Privacy. I believe newest Firefox versions have included everything necessary for fine tuning the referrer. Setting network.http.referer.spoofSource to true does lead indeed to some problems even if in my experience not often. What I’ve never really understood is if referrer data is passed from one tab to another in the browser. If, say, I’m on a library website and I open a bookstore website in another tab, does the bookstore get referrer info from the library? If you open the bookstore from a link on the library website then yes. If you open a new tab and enter the url manually, then no. Okay so what you wrote in the article — “… copy a link and paste it in a private browsing window or another browser to make a direct request” — is not really necessary then? Paste or type the destination into a new (private or non-private) tab in the browser, or you could just re-use another already open tab for the purpose. So what we need is an addon that turns a click on a link into a copy+paste+go of the linked address into the url bar. • network.http.sendSecureXSiteReferrer = false (default: true). Why doesn’t Firefox go ahead to consistently misspell everything in about:config, so as to conform to the historical misspelling ? At least it makes searching about:config easier, w/o having to worry about which (mis)spelling to use. Meanwhile, in the page tag syntax <meta name="referrer” content=”origin”>, it’s back to “referrer”. Hmm, would Firefox recognize the page tag if it were (mis)spelt “referer” instead ? Are these 2 terms technically interchangeable (ie. accepted as synonyms of each other) where browser behaviour is concerned ? I think it comes from the fact that the misspelling crept in the official standard back then, but was corrected recently for “new” stuff. I think I read that somewhere. Do agree though that it is less than ideal. I checked this out and apparently the new way “referer” is the misspelling, but it’s only misspelled in some standards which makes things messy. I’m gonna keep writing “referrer” since that’s right linguistically. I cannot remember which Registry key had been misspelled by Microsoft and couldn’t possibly be changed afterwards for obvious reasons. This key held a famous tweak and many sites proposed this tweak but without the misspelling … leading to a [null] effect :) That was under XP, no idea if it survived afterwards. @Fred — Writing “referrer” when the program/ language requires “referer” (or vice versa) for a particular context renders your action null/ undefined. Perhaps programmers & specifiers of web standards can take reference from how the International Code of Botanical Nomenclature (ICBN) very consistently handles synonyms, intentionally “misspelt/ mispelled” names, as well as accidental misspellings/ typos/ misgendered names. 1) Bold (b) tags are not recognized. 3) Phrases (eg. meta name) can’t be enclosed within the less-than & more-than symbols. The phrase (& even the entire comment itself) will go missing after the comment is published. @Fred — It depends on whose linguistics. For instance, “referer” (référer) is an equally legitimate French verb, meaning “to refer”. We can perhaps think of the historically-mispelt “referer” (English) as internet linguistics. A somewhat related example could be “program’ (software) vs. “programme” (eg. TV or concert programme). However, it is confusing when the internet uses “referer” vs. “referrer” inconsistently. Ay, therein lies the rub … Notice how the article itself missed out Firefox’s about:config > network.http.sendSecureXSiteReferrer — presumably because Martin was only searching for “referer”. As such, methinks it would be better if internet specifications were to stick with one for internet usage, keeping in mind that the other is a synonym. Although I personally prefer “referrer” (because this is the correct British, American, Canadian, Australian & NZ English spelling), I remain aware that I do not own the internet, & therefore cannot dictate how the internet structures its own linguistics. Small planet, big village and arising communication problems. The “universal simplicity” of avoiding double letters for English words seems more like an American protocol. Don’t forget that there also British, Canadian, Australian, NZ, Hong Kong, Singapore, etc. English users who follow the double-letter convention. Eg. Firefox en-US suggests “derogatory”, but that looks off to me who is schooled in British English (“derrogatory”). Has anyone else noticed that the HTTP header "Referer:" is spelled wrong? Correct in Britain, though, no? Nope, we Brits spell it with four R's in total (and that's also the only spelling shown in the OED, with quotes from the 1600's and 1800's). @PJ, “universal simplicity” is not in my thoughts an understatement to advantage one protocol rather than another as such but a quest for a “natural writing” (without the extent of phonetic-driven spelling), and be it American, well, is logical I guess. May be mentioned as well vowels which add nothing to the meaning and seem tied to roots which either are co-substantial of a culture be it popular either of academic elites, e.g. color (US) verses colour (UK), that is if color is still written colour in UK as it was in the past (colour here is mentioned by inline dictionary as misspelled…I know: depends of the dictionary, this one is Firefox’s built-in for the US version…). Anyway languages arise as sometimes a such deep modification of those they are built upon (from) that they emancipate to deliver their full identity, I guess. The idea as I see it is do we (each one of us) or not engage, lean towards, accept or not a pragmatic approach of languages, and if yes to what extent? In school I was taught that some rules have a meaning for understanding the phrase whilst others were legitimate only regarding respect to culture, etymology, roots. As I am not myself an academic I refer my reasoning to the former argument when lesser ot not at all to the latter. So, a choice for everyone of us now and perhaps less in the perspective of time when one day or another academics themselves, unless they be scribes, will have to bend! Thanks for your links, interesting as this topic and our dialogs are. I appreciate them all. Thought i would jump back in here and point out something I noticed yesterday. When trying to log into my TP-Link router it was very unhappy about my having “network.http.referer.XOriginPolicy” set to 1. I had to reset the entry (only one that was changed) back to default to be able to log into my router. I am looking forward to use your privacy&security tweaked user.js…. Am i safe if I have turned on spoof referrer in U-matrix? I just did ….its still blank…. Thanks for the swift reply…. Also about disabling Hardware Acceleration, is it really worth it? https://www.reddit.com/r/firefox/comments/4rgxj4/what_kinds_of_potential_privacysecurity_risks/….does it affect the eff and JonDonym test? I would not worry about this too much, there are bigger things to take care of first like making sure WebGL does not leak your IP address. Highly valuable information! Thank you so much!